For many New Hamsphire and Massachusetts families, the next meal of the day isn’t a certainty. Knowing that many in the region struggle with hunger, Berkshire Hathaway HomeServices Verani Realty (Verani) agents and employees united their efforts in a month-long food drive. The result was over 2,500 pounds of food, plus $12,000 worth of donations through VeraniCARES, to help feed local families. The donations targeted the New Hampshire Food Bank and the Merrimack Valley Food Bank. VeraniCARES is Verani’s social development arm that involves agents and employees in ways to give back to the communities they live in and serve. The idea to focus on regional food banks was spearheaded by agent Lisa Brochu, who is based out of Verani’s Londonderry, N.H. office. Through her local volunteer work, she saw the need for healthy meals in her own community, and coordinated the logistics for a company-wide drive. The food drive was also part of a chain of continued giving back to communities through VeraniCARES. Verani offices turned it into a contest for the highest food drive participation rate, with a grand prize of $500 to donate to their office’s charity of choice. Verani’s Windham location won, with each agent donating an average of 15 food items. When Verani agents and staff arrived at the New Hampshire Food Bank’s headquarters, they got busy unloading five truckloads of non-perishable food items. 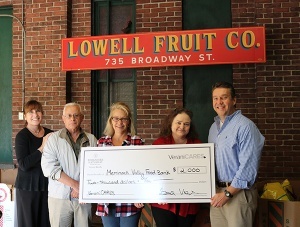 Combined with the VeraniCARES monetary donation of $10,000, the NH Food Bank said they will be able to provide over 21,000 meals. Lisa Smith Dean, events and annual campaign manager at the NH Food Bank, said the VeraniCARES donation arrived at a critical time of year for the agency, as we’re entering the colder season when too often families and seniors have to choose between heat or food. She also noted that their shelves are usually depleted after the summer because of heightened demand while kids are on school vacation. Families that qualify for free or reduced lunch don’t have that resource during the summer, causing an increase in demand for their services. The New Hampshire Food Bank serves 425 partner agencies, which include soup kitchens, food pantries, shelters, and more. About half of the food at partner agencies is supplied by the Food Bank, with the other half coming from the individual donations gathered by the agencies. Visit www.nhfoodbank.org for more information. 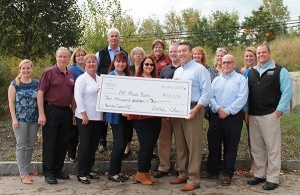 Debbie Callery, assistant executive director of the Merrimack Valley Food Bank estimated the food would create 270 meals, and the financial donation of $2,000 would go three times as far as the actual amount because of the food bank’s buying power. “One dollar equals three dollars’ worth of food, so we can really stretch that dollar a long way,” she said. The food bank serves an average of 70,000 people a month, and despite the organization’s name, their service area stretches beyond the Merrimack Valley out to the coast and into southern New Hampshire. The Merrimack Valley Food Bank is one of four food banks in Massachusetts and provides food and personal care items to food pantries and programs that serve the low-income, homeless and hungry. Their programs include a food distribution program that reaches 30 communities; a mobile pantry for homebound seniors; food rescue to capture perishable goods that would otherwise be thrown out; and summer lunch and supplemental food programs for children. Visit www.mvfb.org for more information. Click here to learn more about VeraniCARES.